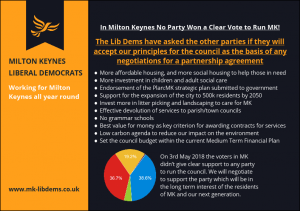 On 3rd May 2018 the voters of Milton Keynes did not give any party a clear mandate to run Milton Keynes. 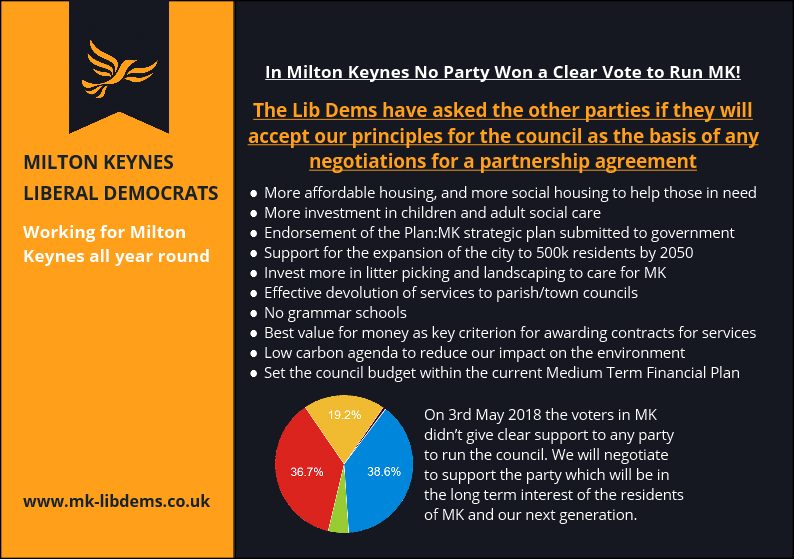 Labour won a few more seats, the Tories won a few more votes, and Lib Dems hold the balance of power which we’ll use to defend the long term interests of Milton Keynes and our residents across the borough. While there is no explicit mention of homelessness the long term solution is to make sure there is enough affordable and social housing so that the council can care for all who are in need. No potholes? All parties agreed more needs to be done – the challenge isn’t the will, it is making sure the policy is set right. The following are our key negotiating points. There is a homelessness crisis in MK, and while those on our streets need most immediate help there are also many residents in MK who are sofa surfing between friends until they have nowhere else to live, and overcrowded houses where a house built for a small family has three generations living in it because a generation with children are struggling to move out of their parent’s home. The only way to solve these problems going forward is to make developers build a greater proportion of affordable housing, and make sure the council has enough social housing to care for those in desperate need of a home. Those in the care of the council are some of the most vulnerable in our society, and the council needs to do more to make sure it does enough for these individuals. The Liberal Democrats will fight for more investment spent well so the council lives up to the expectations that the residents of MK and those in our care should have. Placed at the centre of the Oxford – Cambridge development arc, and between London and Birmingham the government will force MK to expand. Strategic plans such as Plan:MK are our chance to take destiny into our own hands and make sure expansion is in the long term interest of our residents, their children and their grandchildren, and that developers don’t get to build on the cheap without giving the right money for infrastructure. MK is going to continue expanding because of our location. The chances are that by 2050 MK will be reaching 500k even if some people might resist it. By engaging with the government properly we’ll be able to fight for the right long term infrastructure within MK and between MK and the rest of the country (and world!). We must take every positive opportunity to take control of the destiny of MK. MK is becoming increasingly run down. Alongside a priority to fix potholes we must also make sure that there is the right amount of money spent to keep our streets clean and clear for our residents. As the Tory government in Westminster continues to slash the council budget of MK (another £14m this year) some services may be best run closer to the community within Town, Parish and Community councils. The Liberal Democrats believe that there must be positive engagement to make sure the right services are delivered by the right level of government. Liberal Democrats will continue to defend non-selective education, and we will continue to oppose the opening of any new grammar schools in Milton Keynes. The Liberal Democrats believe that the most important part of a decision to decide who provides a particular service to residents is value for money (not necessarily cheapest! ), not who provides the service. Whoever might run a service, we must make sure that it is based on evidence that it is the best value for money for council tax payers. The Liberal Democrats are the party that took the MK recycling rate from 11% to 55% in the early 2000s, and we continue to be passionate about MK doing it’s part to protect our local and the global environment. We fully support having a low carbon agenda, alongside reducing our use of single-use plastics and other critical policies to protect our future. As the Tory government in Westminster continues to slash our council’s budget we can’t support any party which would raid the reserves in exchange for short term headlines. Whichever party runs the council they must make sure there is a sustainable budget which will protect our area in the long-term, and avoid the council running out of money has happened in neighbouring Northamptonshire. In conclusion, while we will support other parties in areas where there is absolute agreement that we must prioritise more help for those who are homeless and fixing potholes to make our roads, paths and redways safe to use, we must make sure that the council will look after the long term interests of MK and that any expansion is well planned into the future.